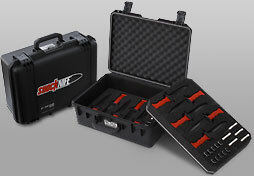 SETCAN Corporation - SHOCKNIFE Products. 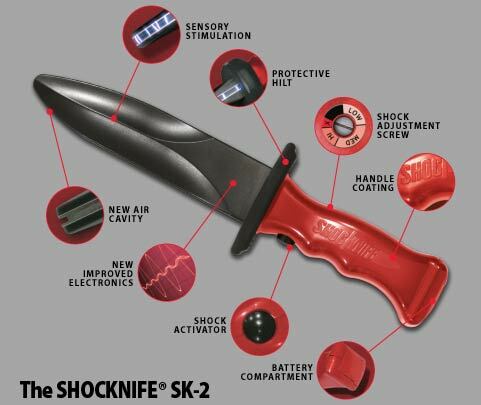 The Shocknife SK-2 (patented) is an ingenuous balance between safety and performance. The composite blade is incapable of cutting. It delivers a localized shock that causes pain, but not serious injury or incapacitation. The SK-2 has four voltage settings. At its highest setting the SK-2 delivers up to 7,500 volts and less than 1 milliamp. The Shock Activator switch allows the user to control when the shock is delivered. Sensory Stimulation - When activated the blade assaults your senses by producing sparks in a menacing fashion. Shock Adjustment Screw - SAS allows for four settings. Low, Medium, High, and Extreme. The SAS is recessed into the handle to prevent accidental adjustment. Battery Compartment - The SK-2 uses a standard 9 volt battery with easy access for quick replacement. 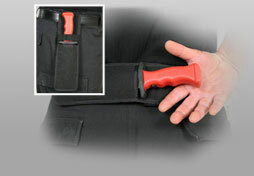 Protective Hilt - The soft rubber hilt protects the user from shock and injury. Shock Activator - Easily accessible button allows for various gripping styles. It ensures shock is only delivered when required. 1 year warranty, online Safety Monitor Certification Course, Protective Carrying Case, and Shocknife Accessory kit all included. Stress Exposure Training - A real knife attack creates a feeling of panic causing your body to respond with the “fight or flight” syndrome. That same acute stress can now be replicated during training by setting the SK-2 shock level to EXTREME. At this level the knife sparks and growls, ready to bite with each attack. Cut Location Indicator - The SK-2 delivers a powerful shock upon contact allowing the trainee to recognize both WHERE and WHEN they were exposed during the attack. The shock will even arc through clothing! Unlike marking knives there is no messy marking compound to clean up after training. Stress Inoculation Tool - True Stress Inoculation Training involves an incremental exposure to a stressor. The SK-2’s four different shock level settings range from LOW to EXTREME, making it the only training tool in the world that can truly claim the ability to provide incremental stress training. The varied settings allow everyone that trains with the SK-2 to advance at their own pace. Realistic Research - For the first time ever, the SK-2’s ability to create fear reponses will allow researchers the opportunity to simulate and study realistic edged weapon attacks. Are you or your instructors still teaching the 21 foot rule? Try replicating the study using the SK-2, the results will truly SHOCK you! 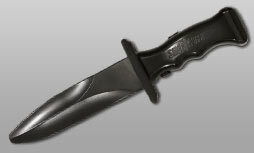 Reduced Liability - Are you using the training knife that will best prepare your officers or soldiers to survive an edged weapon attack? The average settlement for failure to provide adequate training is $1.2 million dollars. The SK-2 is the only training knife in the world that can replicate the same mental and physical responses necessary for realistic training. 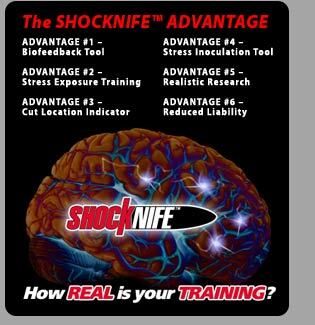 Biofeedback Tool - Set the adjustable SK-2 shock level to LOW and the blade of the knife becomes your instructor. It uses a mild painless shock to provide feedback when your technique needs correction. Save time, energy, and money by training more efficiently. Designed as an entry level trainer, the Shocknife® StressBlade allows Instructors the ability to add acute stress to their edged weapon training in the most affordable way possible. Using a standard 9 volt battery, the Shocknife® StressBlade delivers a constant shock level of 7,500 volts with a safety factor of less than one milliamp. With only one setting, the Shocknife® StressBlade is perfect for use in high stress scenarios. 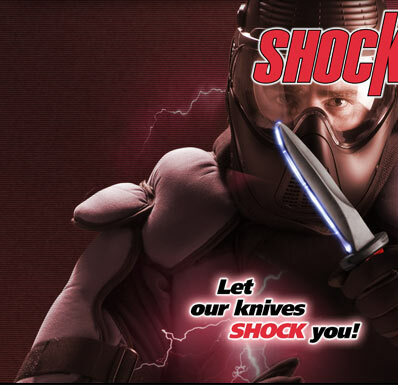 At half the cost of our professional version, the Shocknife® StressBlade puts power within your reach! 90 day warranty is included. Online Safety Monitor Certification Course, Protective Carrying Case and Accessories all sold separately. This custom designed Shocknife Sheath will allow Instructors and Role Players to carry the knife in a convenient protective sheath while the product is not in use. It will also allow Role Players to safely conceal the knife without the risk of accidentally activating the Shocknife and shocking themselves. - Free dark lenses to simulate low light conditions! These Birdz Eyewear goggles completely surround the eye to provide protection from incidental contact during Shocknife training. • Vented frame to prevent fogging. • Lenses made of shatter resistant polycarbonate. • Lenses UV400 with special anti-fog coating. • Flexible frame with padding. • One set of clear and one set of dark lenses. • Fits over most eyewear! • Soft micro fiber carrying pouch that doubles lens and Shocknife blade cleaner. Fitting snugly around the neck, the Shocknife Protective Neck Guard is produced of high-strength textile. 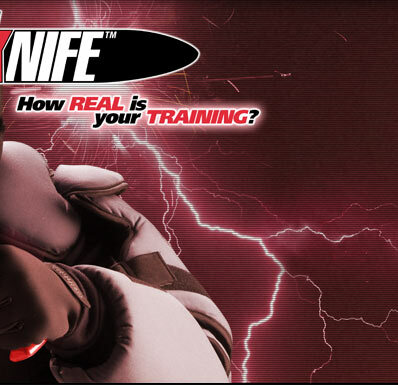 Shocknife requires that anyone utilizing Shocknife products to train their students be certified as a Safety Monitor. This e-learning course takes between 2 - 3 hours to complete, and educates Instructors on how to ensure their students use Shocknife products in the safest manner possible regardless of what style of training they use.